There is something that has been happening during our weekday mornings that words cannot possibly grasp. I’ll explain some of my emotions: anger, rage, sadness and depression. It usually goes in that cycle too. Thank goodness once I’ve survived and made it to the gym around 9:30, I’m given a dose of endorphins that keeps me going. However, the pain and agony of the morning is causing me a ton of anguish and starts my day off horribly. Do it…done it…yes. We have done it all. And the really agonizing part of it is that there isn’t one problem or issue. Yes, Drew has a really hard time moving in general and the morning is the hardest. Yes, Gabby has nonstop outfit issues and defiance problems. Yes, Noah just sometimes wakes up on the wrong side of the crib. All those things are part of the problem. Sometimes one has an issue and sometimes I’m lucky enough to be targeted by all three. The real issue is how upset I get. The real issue is how this negativity eats at me and causes me to resent my children and walk around with dark cloud above me. And that I certainly must be able to control. But how????? How do I let these negative exchanges effect me less and just roll off my back? If I could learn to do this, I might even find that my children’s behavior improves. And despite that I know and understand this, I can’t seem to help but perpetuate this negativity day in and day out. 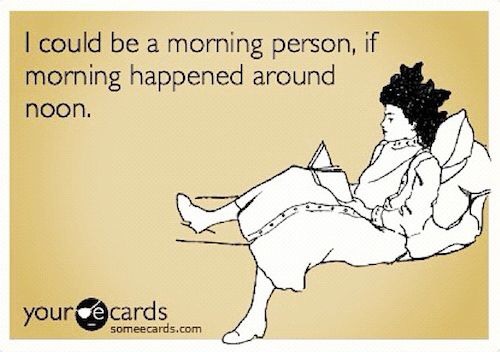 Probably doesn’t help that I’ve never exactly been a morning person!!!! « « It’s GO Time!! !